Octron was Enthusi’s first attempt at game coding around 2007-2008 time – the game being an impressive 8 player Tron game! To play with 4 players, you would need a 4 player adaptor, and for 8 – two C64’s and two 4 player adapters, with the C64’s connected via a floppy serial cable. The preview included here to download has all 8 players available. It is still at a fairly early stage, but does have a loading screen created by JSL and in place. So what happened to the game? Enthusi sadly lost interest in developing the game, and so it was resigned to the scrapheap. More details of the game can be read in Creators Speaks. What you see here is all that remains of the game, so it is an open and shut case! 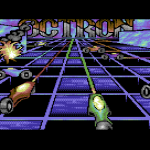 “Octron started out as my first attempt in game coding. I picked up work on it in 2007 and 2008 again but instead of finishing what is there, I’d rather rewrite it from scratch now, which again is not too likely to happen any time soon. So here it is. Sorry JSL for keeping your very nice title screen hidden for so long! The idea was to have an 8 player Tron game. The earlier version included still features a menu to select number of players. This fully works. To play with > 2 people use a 4 player adapter (the kind, i.e. Bombmania requires). To play with i.e. 8 people you need two c64s and two 4-player adapters. Connect both C64 via floppy serial cable. Launch ‘send’ on one of the two (load it before you connect the c64s) and SYS 61061 after reset on the other before you start the game. The one that runs ‘SEND’ is a mere server for the 4 joysticks, no screen output. The game works with up to 8 players at this stage 🙂 I had plans and some code to use software scrolling instead and 8 different colors for the trails etc… The map in the lower border isnt fine tuned yet. 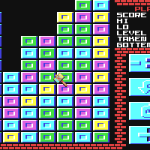 In the ‘earlier’ version, a map for each player gets displayed after game over. Enjoy if you can. Maybe one day I will return to this early attempt of mine.